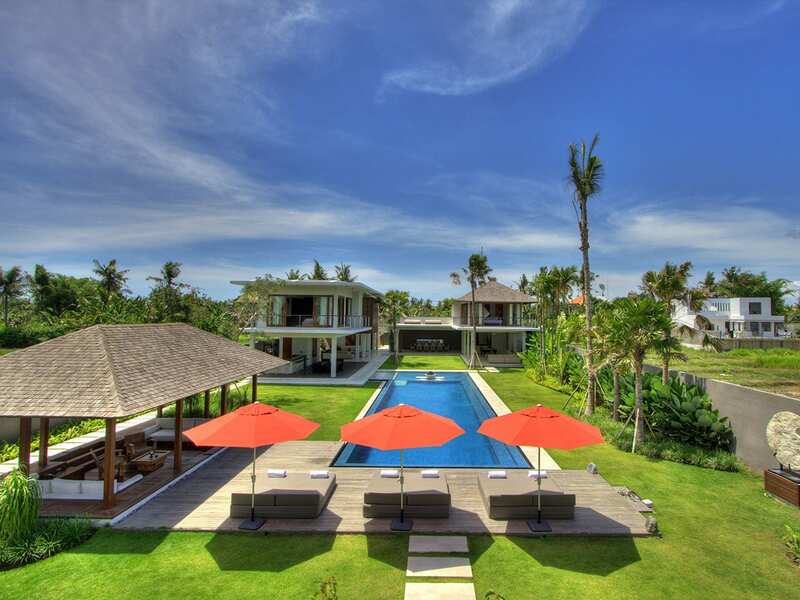 One part traditional Balinese aesthetics and one part modern luxury, Villa Bunga Pangi is a stylish private 4-bedroom luxury villa nestled in peaceful Pererenan village just minutes from Canggu. 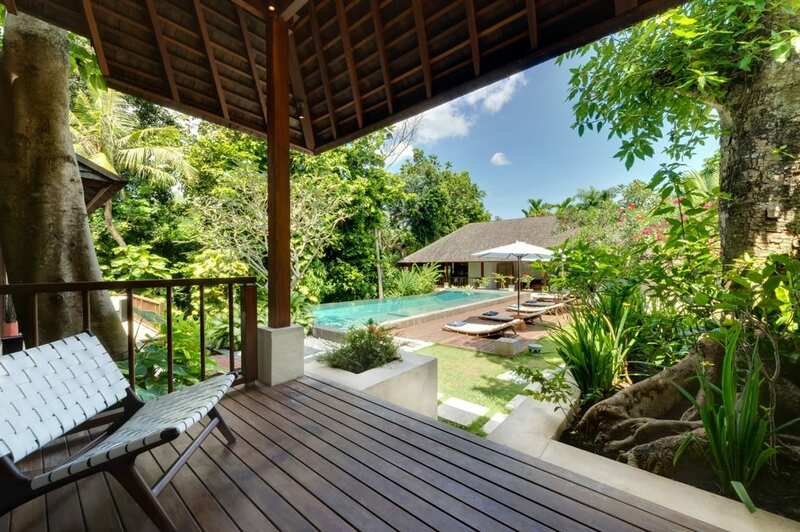 With 5 separate pavilions for relaxing, entertaining, dining and sleeping, this is the perfect holiday getaway for couples, families and those looking for all the comforts of home in a beautiful natural setting. 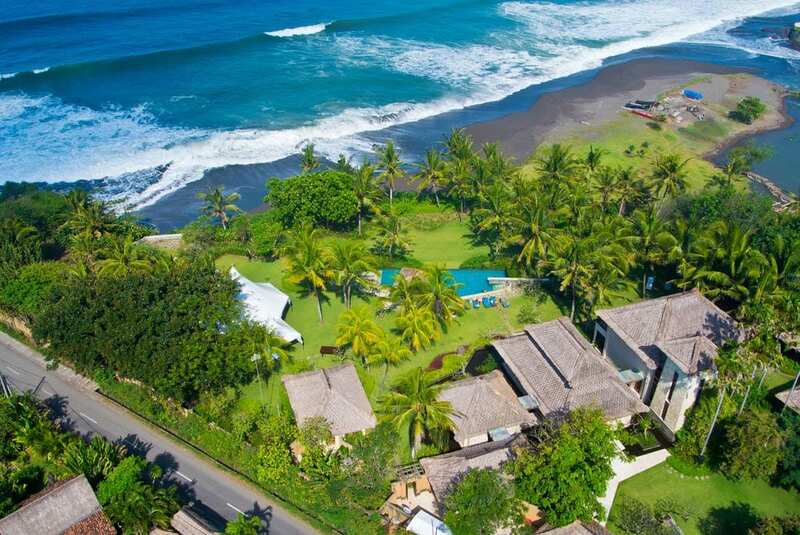 Whether you plan to spend your holiday switching off next to the pool, throwing elegant dinner parties or exploring the beaches, surf breaks and temples of Bali’s beautiful west coast, Villa Bunga Pangi won’t disappoint. 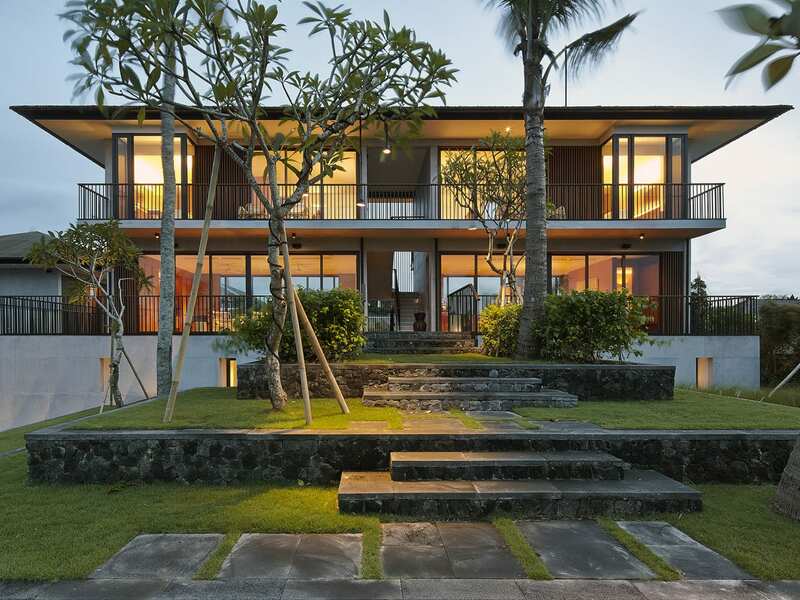 It’s all about the blend of indoor and outdoor living at Villa Bunga Pangi. 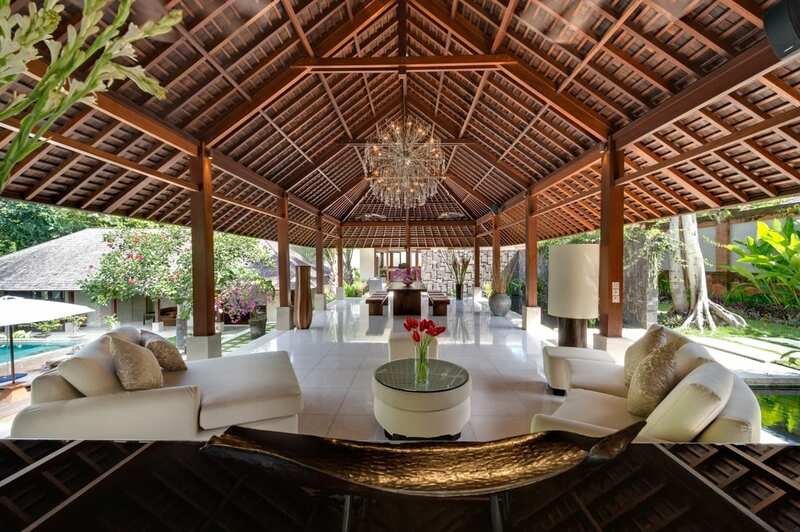 The spacious living and dining pavilion here is covered, yet open on all sides to allow for natural air conditioning and views of the tropical greenery and the aquamarine pool. 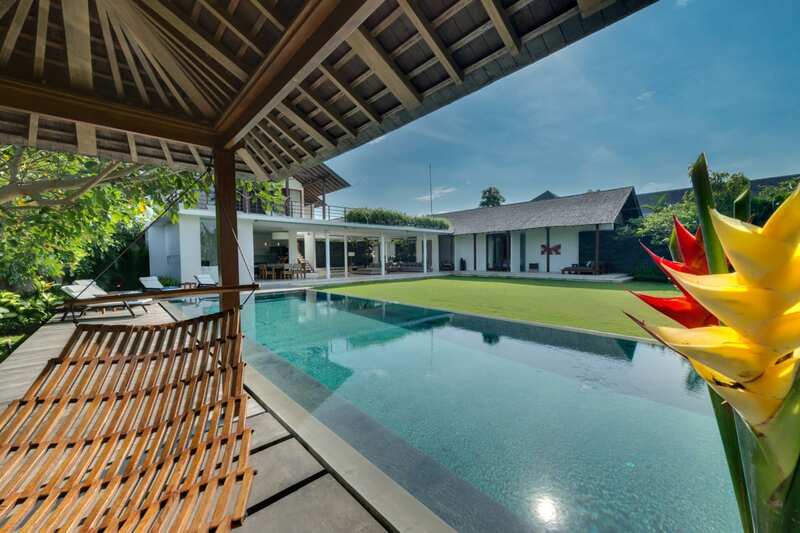 Spend your days lounging on the day beds and sofas, sunbathing on the comfy loungers and taking leisurely dips in the multi-level pool that overlooks the lovely Pangi River. As night falls, head to the breezy dining table for delicious meals prepared by the talented villa chef, followed by bespoke cocktails at the custom-made bar. 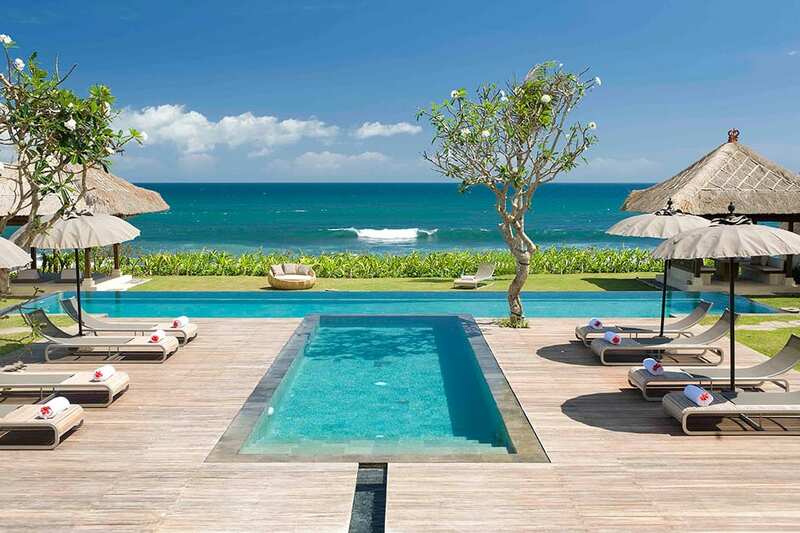 Nightlife lovers will want to head to nearby Seminyak for some of Bali’s best bars and clubs, and those looking for a quiet night in can chill out in the fully equipped media room with good movies and music. When you finally do retire to your air-conditioned bedroom, the only sounds you hear will be crickets and frogs as you drift off to sleep. 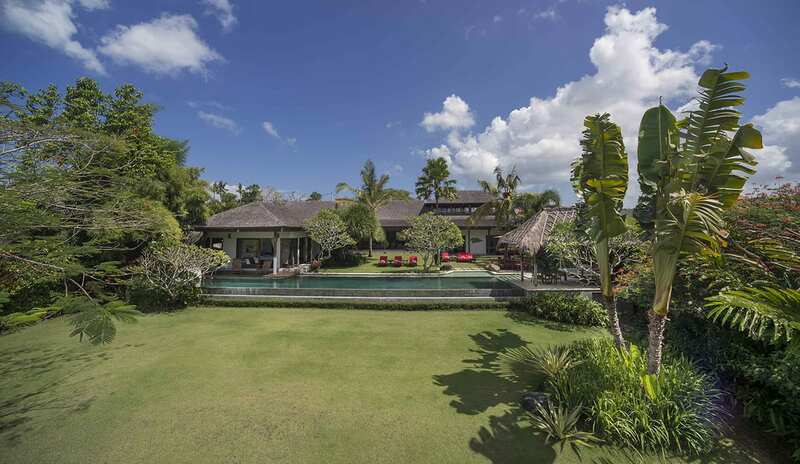 The main living and dining pavilion at Villa Bunga Pangi is a beautiful open-concept area with white marble floors, wooden pillars, sleek white sofas and a solid wooden dining table that can seat up to 10 people on cushioned benches. The space is open on all sides, so you can take advantage of the fresh air, sunlight and lovely views of the pool and gardens. This is a great space for entertaining, as there is a state-of-the-art stereo with an iPod connection and a custom built bar with bar stools, a fridge and a wine cooler. 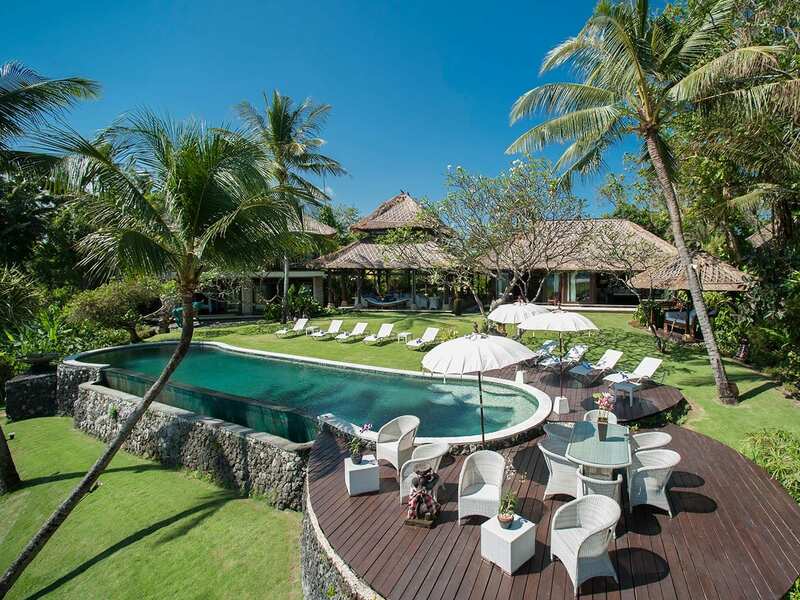 The staff at Villa Bunga Pangi can also prepare lavish spreads and creative cocktails on request for groups and parties. 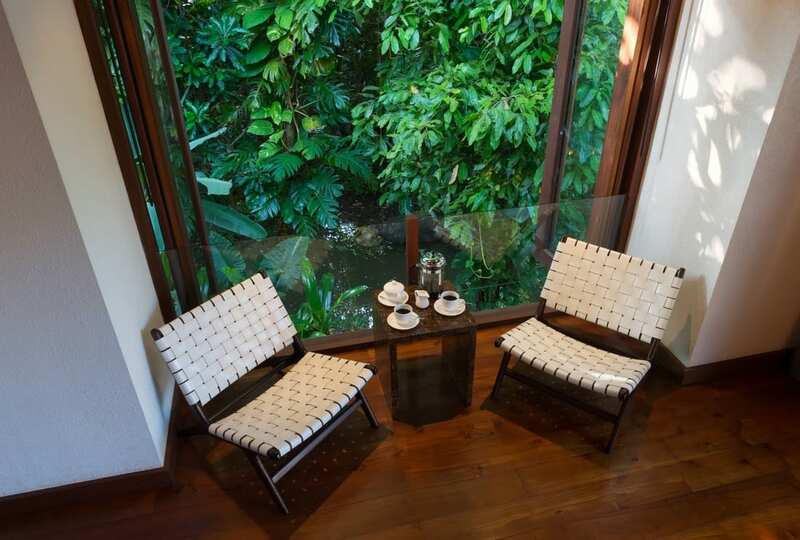 The Master Bedroom enjoys a scenic location next to the peaceful Pangi River, and boasts a beautiful terrace with reclining chairs overlooking the river. Inside you will find beautiful polished hardwood floors, soft lighting, a king-sized bed, a writing desk and a bathroom with double sinks, a shower and a toilet. 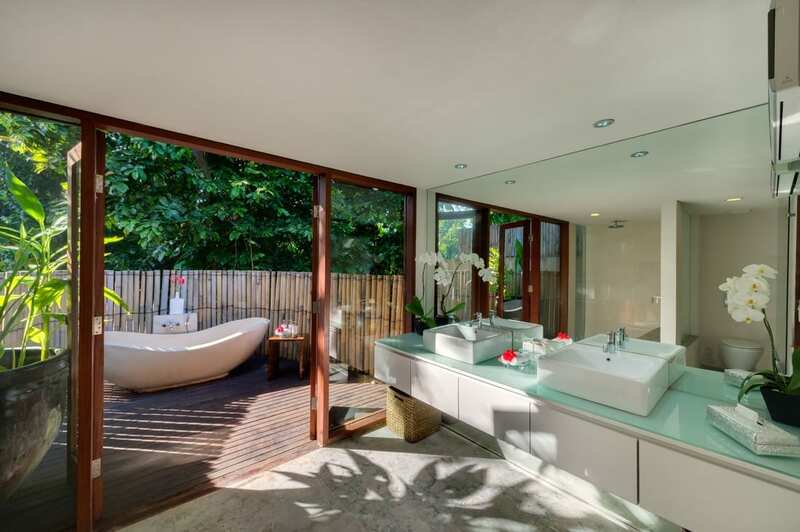 However, the most spectacular feature of the Master Bedroom is the attached outdoor patio with a massive bathtub that can easily fit two and a bamboo fence for privacy and seclusion. 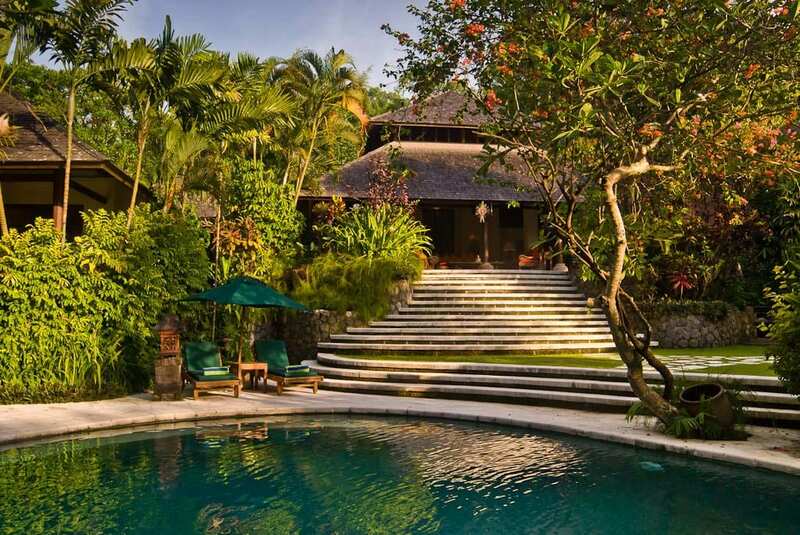 There are three other bedroom suites at Villa Bunga Pangi, all of which are housed in their own private pavilions and have twin or double beds, plush armchairs, Yamaha sound systems that are iPod compatible and modern ensuite bathrooms with bathtubs, showers, double sinks and toilets. 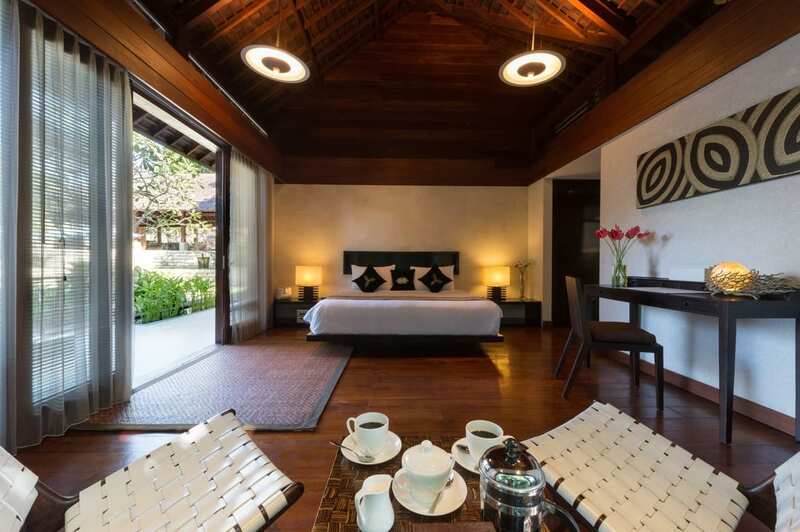 Bedrooms 2 and 3 also share an outdoor terrace with an inviting daybed, a cooling ceiling fan and a massage table that overlooks the river, rice fields and pool. Next to the Master Bedroom there is a cozy air-conditioned media room that has a daybed and plenty of easy chairs for settling in with a good book or movie or chilling out and listening to music with friends. The room is fully equipped with a Samsung LCD flatscreen TV, a DVD player and a Yamaha stereo system that is iPod compatible. 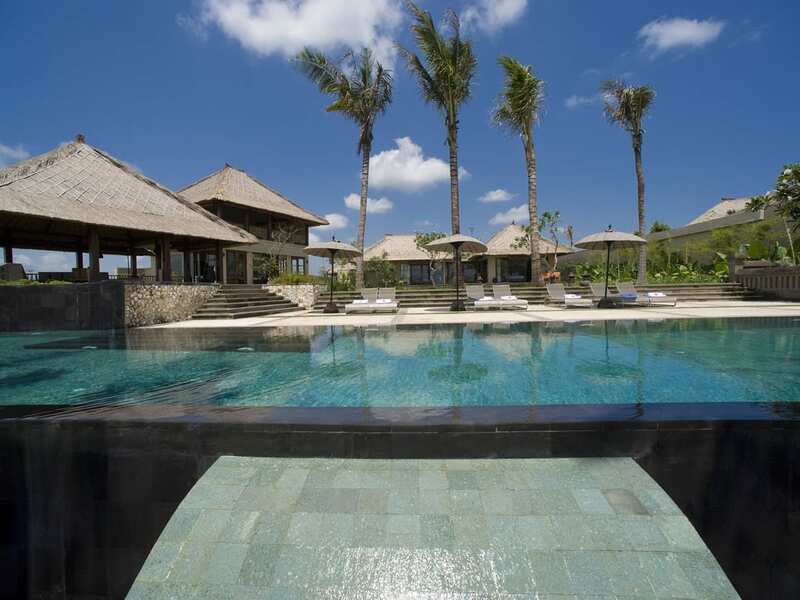 The pool at Villa Bunga Pangi is ideal for guests of all ages and swimming abilities, as it has three levels that are all different depths. 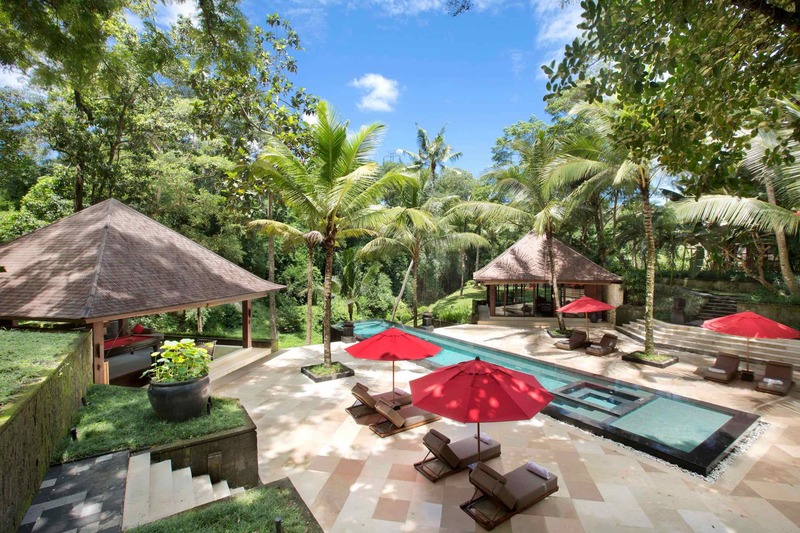 Toddlers can splash around in the shallow level, serious swimmers can do laps in the deep end, and those simply looking for a relaxing dip can soak in the lower plunge pool level overlooking the river. 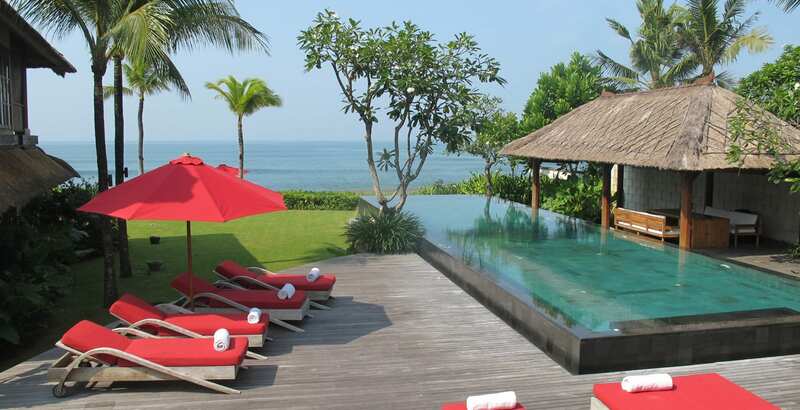 If you’re looking to work on your tan, there are a number of inviting sun loungers on the wooden pool deck that offer fresh air and great views. 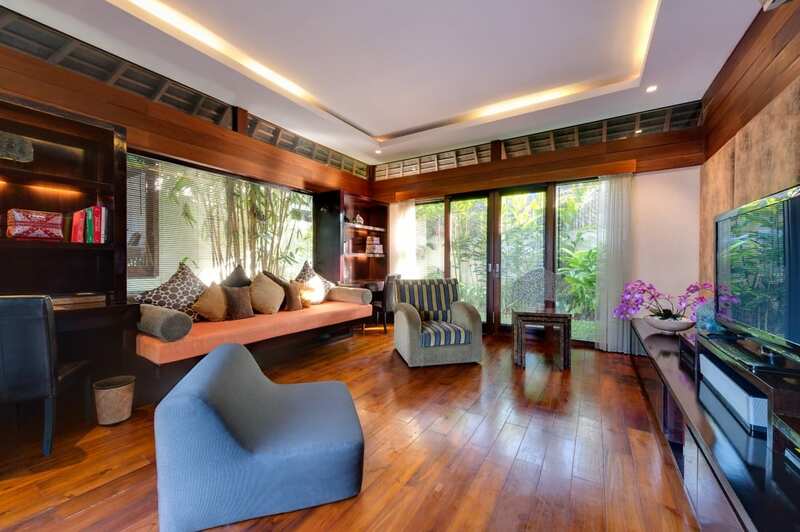 LIVING AREAS Living pavilion offers a dining area hosting 8 to 10 guests, a relaxing lounge area that gives you a full view of the grounds and garden, a fully equipped custom bar, kitchen, media room. POOL 18m infinity pool, plunge pool. ENTERTAINMENT Satellite TV, DVD player, Yamaha sound system, iPod connection, poolside Speakers, media room with 52 inch flat screen TV. FOR FAMILIES Baby Cot & High Chair available. ADDITIONAL Barbecue, back-up generator, safety deposit boxes, professional massage bed. 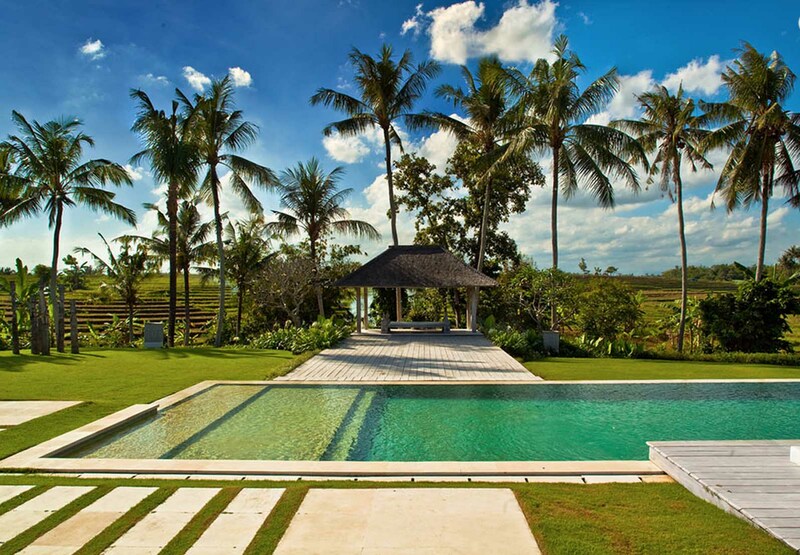 Villa Bunga Pangi is located in the lush and tranquil setting of the rice paddies of southwest Bali. 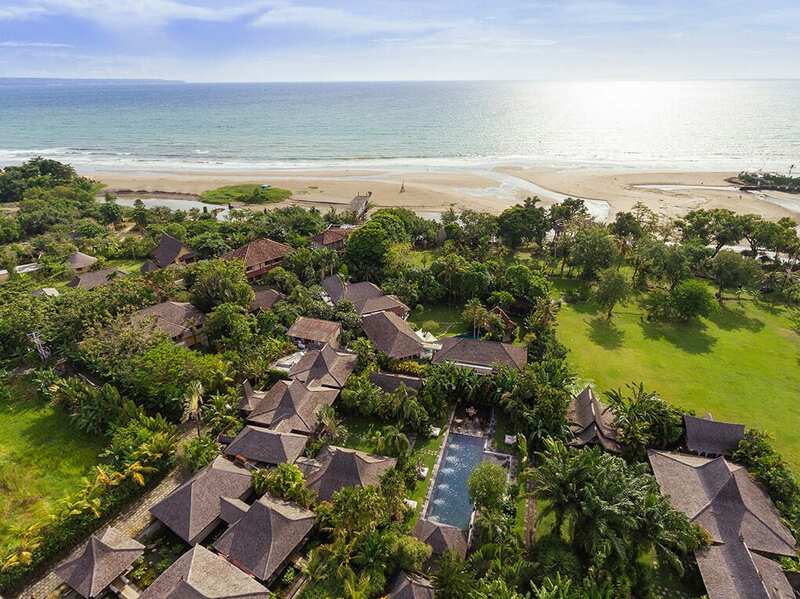 Apart from the wonderful rural countryside of rice-paddies and Balinese villages, Villa Bunga Pangi is also set close to the coastline so you can equally enjoy the surrounding beaches. There are a number of great cafes and organic eateries around the area. 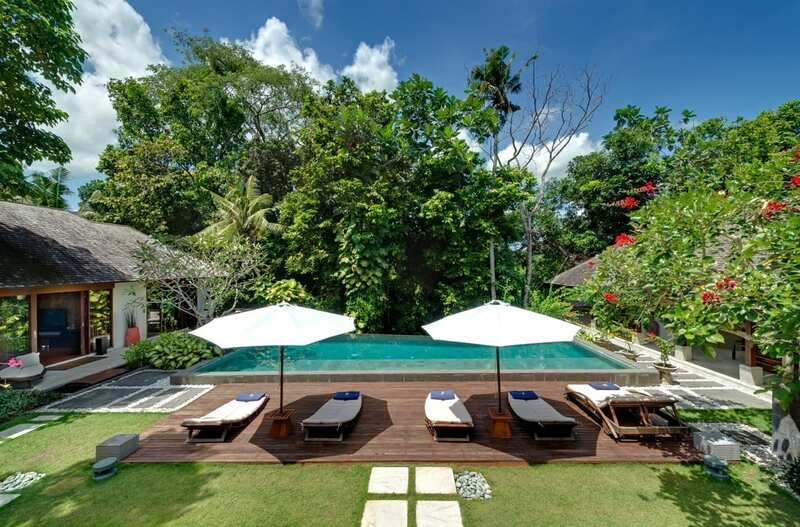 Our stay was truly memorable and our sincere thanks to all of the staff for their attention to detail, their friendliness, the wonderful meals and the quiet efficiency with which they went about the task of making our stay as enjoyable as possible. The accommodation is delightful, it exceeded our expectations by a large measure. 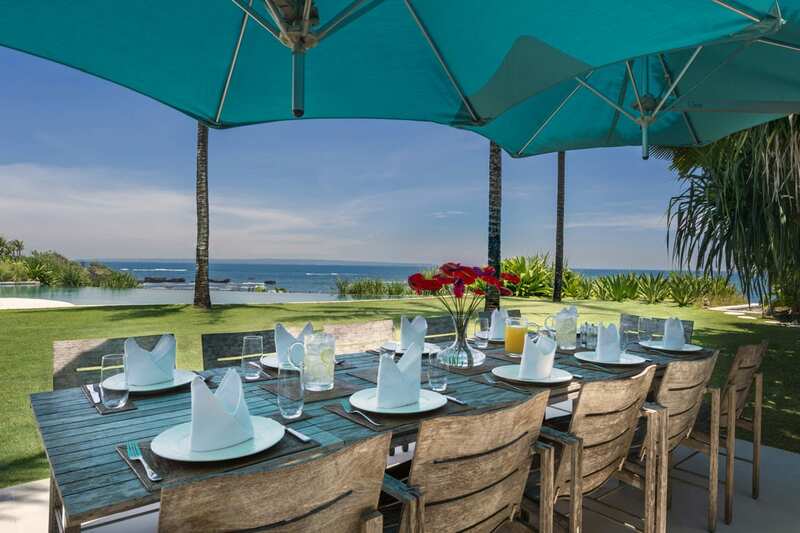 The setting is wonderful and there is even a cooling breeze sitting at the dining table overlooking the fabulous infinity pool. 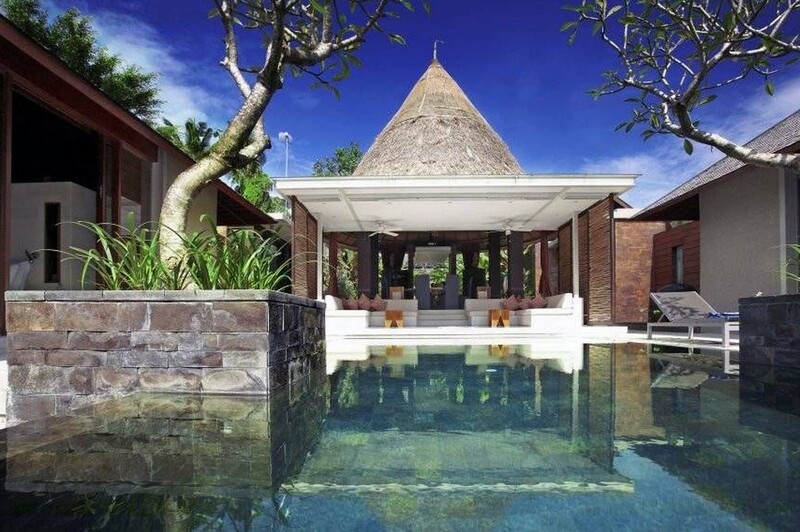 We would thoroughly recommend Villa Bunga Pangi to couples and family groups as the whole package gives rise to a truly memorable holiday. We had the holiday of a lifetime with our 3 adult children, and we would not hesitate to tell friends and others that this accommodation is truly the best we have ever encountered. While the setting and facilities are wonderful what made it exceptional was the staff and the delicious food. Thank you for a fantastic holiday. 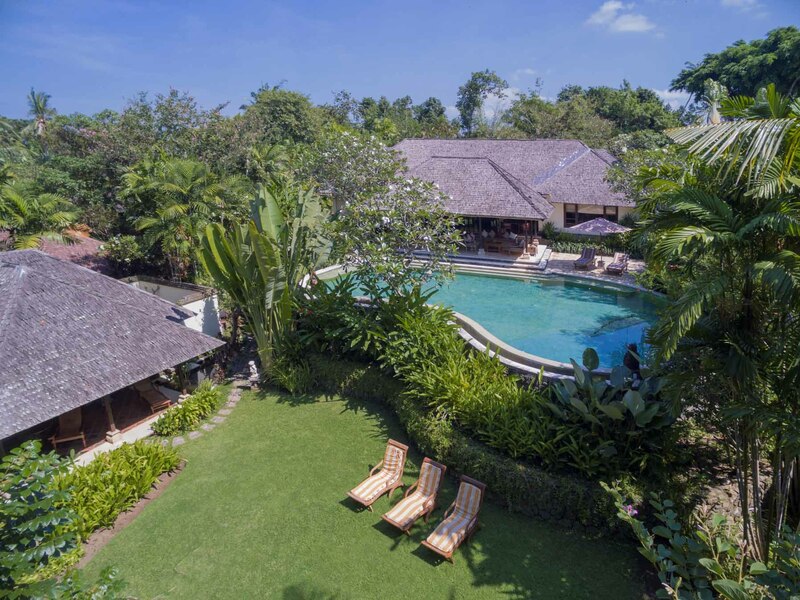 We stayed at Villa Bungi Panga to celebrate a Milestone Birthday, as a family group: my partner and I, my two sons, one daughter-in-law and three baby grandsons - and my 85yo mother joined us, travelling from Cornwall. 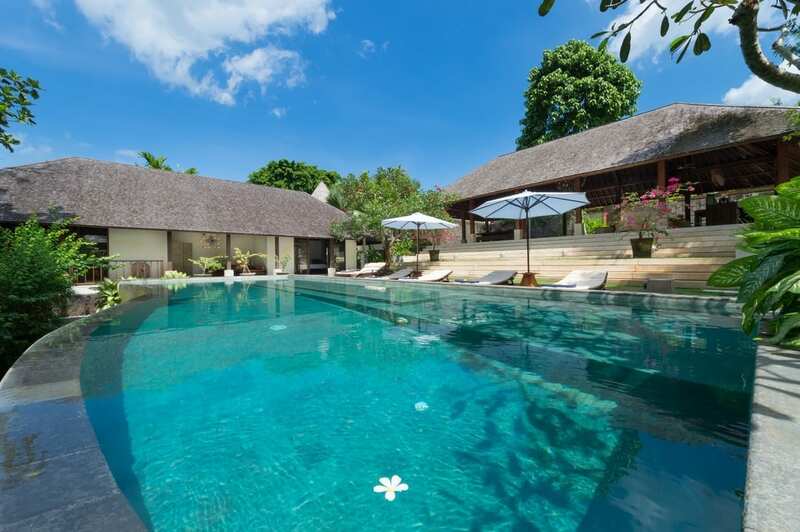 The Villa itself didn't disappoint and we all loved our spacious, well-appointed and comfortable rooms - plenty of space in each, and all looking onto the central swimming pool and then the living and dining areas. 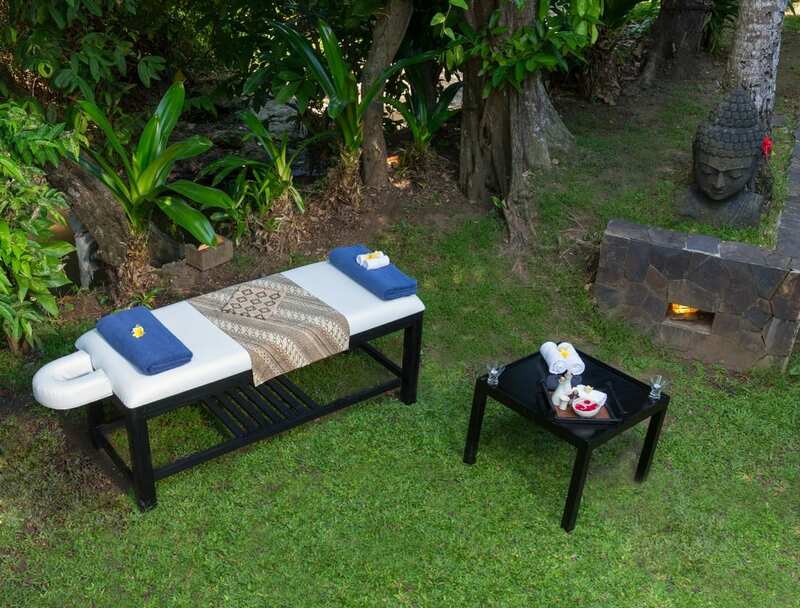 The place is immaculately kept - rooms, pool, communal areas and the gardens too. 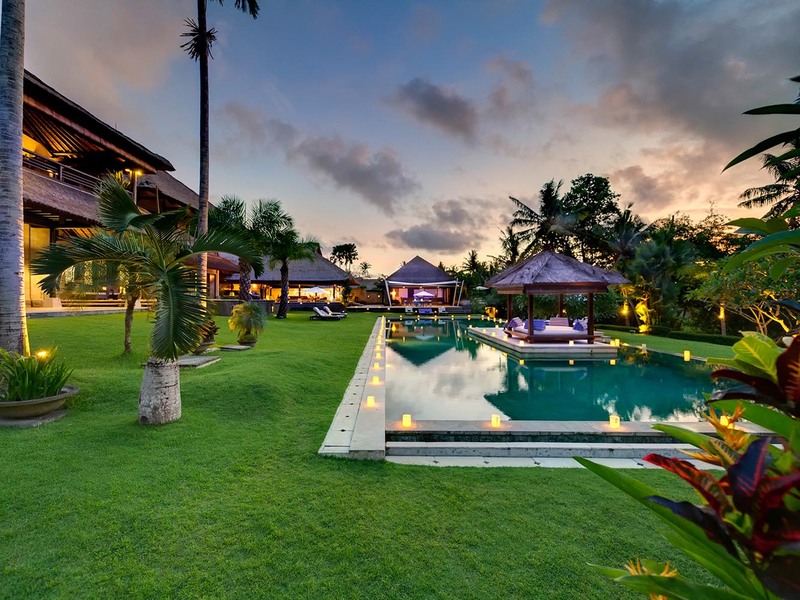 Just beautiful - a real haven and such a calm retreat. Then there are the staff: words cannot express how well we were looked after and cared for. From Agung the manager/chef and his culinary creations, to Putu and his calm manner as he drove us around in a group or individually to see some of Bali's attractions, to "The Team" of women and men who helped in the kitchen and at the dining table, looked after the pool and gardens and rooms, and who were always ready with a genuine smile and a welcoming greeting. Nothing was truly too much trouble for any of them, and we truly appreciated all their care and help. 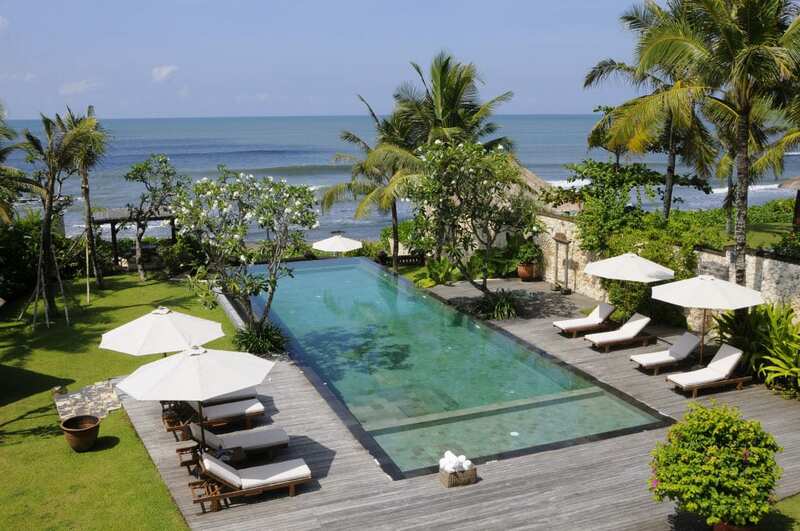 Just fabulous - the place, the ambience, the meals, and especially the people. We were all truly sorry our wonderful time there came to an end - but we look forward to another visit to Villa Bunga Pangi before long. A special place, and a special time.